The artist's studio; acquired c. 1823 by Charles William Stewart (later Vane), 3rd marquess of Londonderry [1778-1854], Londonderry House, London; by inheritance to his son, Frederick William Robert Vane, 4th marquess of Londonderry [1805-1872], Londonderry House; by inheritance to his half-brother, George Henry Robert Charles William Vane-Tempest, 5th marquess of Londonderry [1821-1884], Londonderry House; by inheritance to his son, Charles Stewart Vane-Tempest-Stewart, 6th marquess of Londonderry [1852-1915]; by inheritance to his son, Charles Stewart Henry Vane-Tempest-Stewart, 7th marquess of Londonderry [1878-1949], Londonderry House; his estate; (sale, Sotheby's, London, 16 November 1962, no. 34); purchased by M. Comer for Lillian R. Berkman [Mrs. Jack N. Berkman, formerly Mrs. Marc B. Rojtman, 1922-2001], New York; her estate; bequest 2003 to NGA. Londonderry House, formerly Holdernesse House, was bought from the 6th lord Middleton in 1822 by the 3rd marquess of Londonderry, and in the next few years was almost entirely rebuilt. Among the collection of marbles at the house, this sculpture is one that has been assumed to have been acquired by the 3rd marquess while he was Ambassador in Vienna from 1814 to 1822, but there appears to be no proof of this. A letter the marquess wrote from Rome on 20 February 1823 to one of the Wyatts concerning the project for rebuilding Holdernesse House confirms his presence there, and another possibility is that the sculpture was acquired during this visit, not long after Canova's death on 13 October 1822. See the catalogue of the 16 November 1962 Sotheby's sale (p. 14), and H. Montgomery Hyde, Londonderry House and Its Pictures, London, 1937: 16, 20, 21. Bassi, Elena. 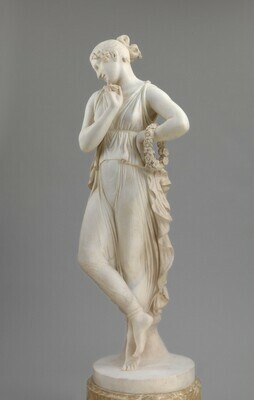 Antonio Canova a Possagno. Catalogo delle opera. Guida alla visita della Gipsoteca, Casa e Tempio. Treviso, 1972:80. Borsellino, Enzo. "Una ‘Danzatrice’ di Antonio Canova dispersa in Russia." Paragone 49 series 3, no. 19 (May 1998): 32-29, plates 1-19; esp. 7, 20 n. 20. Androsov, Sergej, Fernando Mazzocca and Antonio Paolucci with Stefano Grandesso and Francesco Leone. 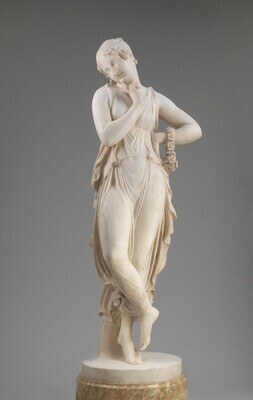 Canova: l’ideale classico tra scultura e pittura. Exh. cat. Musei San Domenico, Forli, 2009: 268-271, esp. 270.